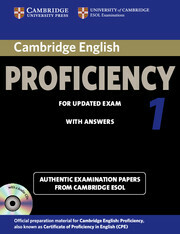 Cambridge English Proficiency 2 contains four complete and authentic examination papers for Cambridge English: Proficiency, also known as Cambridge Certificate of Proficiency in English (CPE). This collection of past examination papers provides the most authentic exam preparation available. They allow candidates to familiarise themselves with the content and format of the examination and to practise useful examination techniques. 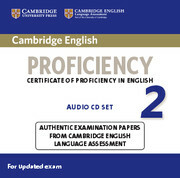 These Audio CDs contain the recorded material to allow thorough preparation for the Listening paper and are designed to be used with the Cambridge English Proficiency 2 Student's Books. A Student's Book with or without answers, and a Student's Book with answers with downloadable Audio are available separately. Cambridge English Proficiency 1 for updated exam (commencing March 2013) contains four complete and authentic examination papers for Cambridge English Proficiency, also known as Cambridge Certificate of Proficiency in English (CPE).